It’s hard not to be amazed by Russia’s eighteenth century Catherine Palace. With its sky blue and gold gilded façade, the building is three stories of “whipped cream” Rococo architecture. The interior is equally stunning: grand halls with marquetry floors, ornately-painted ceilings, and, of course, wall-to-wall flowery molding dripping with gold leaf. Private collector Carole Kaye commissioned Robert Dawson of The Modelroom to miniaturize the fairy tale magic of the Catherine Palace. Nearly a decade later, the finished product has been gifted to the Kathleen Savage Browning Miniatures Collection at the Kentucky Gateway Museum (on view through April 30, 2016). 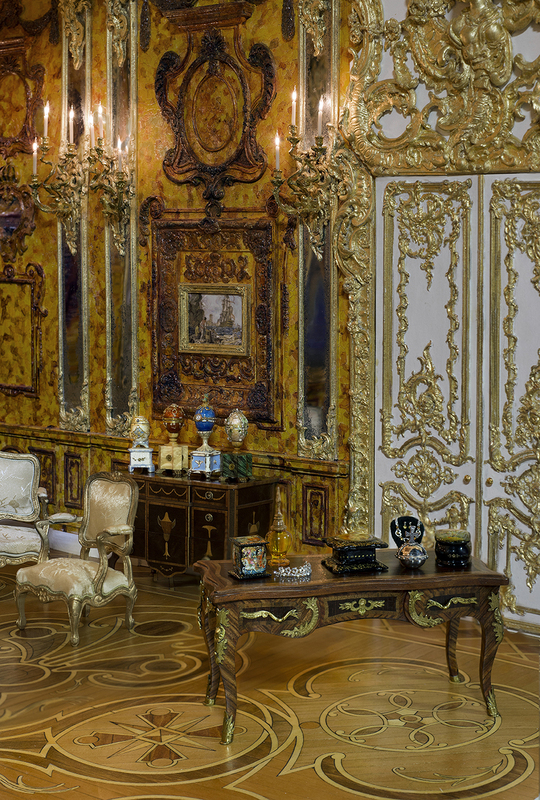 One of the most stunning rooms in the miniature palace is a 1:12 scale interpretation of the Amber Room, in which Dawson hand painted and engraved hundreds of pieces of veneer to emulate amber. The full-scale Amber Room was once considered the “eighth wonder of the world.” Maybe the miniature Catherine Palace could be considered for the ninth!